Harringtons complete dry dog food. I thought dogs were carnivores. Why would they be eating rice?? this is not a deal its only 5kg!!! where is it cheaper then? In reality a dog is an omnivore you'll find. This is not available in smaller stores. Dogs are definitely omnivores, as per previous statement. rather than explain why not try googling it for more concise information? given the opportunity most dogs will eat anything therefore they are definitely omnivores and have no problem digesting vegetable matter. They are natural scavengers and will eat anything they come across. 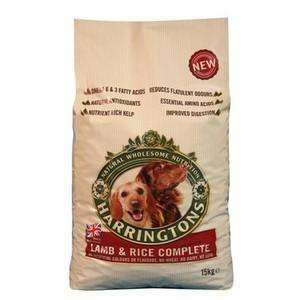 Great offer posted on Harringtons 5 Kg dog food but has it finished ? "Unlike obligate carnivores, such as the cat family with its shorter small intestine, dogs can adapt to a wide-ranging diet, and are not dependent on meat-specific protein nor a very high level of protein in order to fulfill their basic dietary requirements. Dogs will healthily digest a variety of foods, including vegetables and grains, and can consume a large proportion of these in their diet." So maybe you're thinking of cats instead? Generally speaking an animal's instincts would not allow it to eat something that would be unhealthy for it - although of course dogs now live in a human world where things such as chocolate, which they wouldn't find in the wild, exist and are hazardous to their health, but they'll eat it regardless because it just smells so damn good, and some dogs have been inbred to the point of complete stupidity. But if you put something healthy, like rice, in front of a dog, and it eats it, then it's pretty much safe to say it'll be alright. If dogs were strictly carnivores they'd be extremely expensive to keep; dog owners would have to start keeping chickens and cows and things like that to slaughter just to feed their dogs. Dogs could probably do with more real meat in their diet than dog food provides, but it's designed to provide everything a dog needs in its diet in vegetables as well. Like any vegetarian would tell you, it's all about vitamins and minerals, etc., and most of what you would find in meat could be alternatively found in some vegetable or other. Not sure where you got that from, but a quick search brought up this on … Not sure where you got that from, but a quick search brought up this on Wikipedia -"Unlike obligate carnivores, such as the cat family with its shorter small intestine, dogs can adapt to a wide-ranging diet, and are not dependent on meat-specific protein nor a very high level of protein in order to fulfill their basic dietary requirements. Dogs will healthily digest a variety of foods, including vegetables and grains, and can consume a large proportion of these in their diet. "So maybe you're thinking of cats instead?Generally speaking an animal's instincts would not allow it to eat something that would be unhealthy for it - although of course dogs now live in a human world where things such as chocolate, which they wouldn't find in the wild, exist and are hazardous to their health, but they'll eat it regardless because it just smells so damn good, and some dogs have been inbred to the point of complete stupidity. But if you put something healthy, like rice, in front of a dog, and it eats it, then it's pretty much safe to say it'll be alright.If dogs were strictly carnivores they'd be extremely expensive to keep; dog owners would have to start keeping chickens and cows and things like that to slaughter just to feed their dogs. Dogs could probably do with more real meat in their diet than dog food provides, but it's designed to provide everything a dog needs in its diet in vegetables as well. Like any vegetarian would tell you, it's all about vitamins and minerals, etc., and most of what you would find in meat could be alternatively found in some vegetable or other. Yeah there were a few articles suggesting that dogs are physiologically OK with vegetable matter but the general consensus was that they are not. Very confusing subject. Not sure why.